On October 11, Federal Parliament voted to apologise to Olympian Peter Norman for the treatment he received at the 1968 Mexico City Games. You may think that this apology was slightly overdue; its tardiness perhaps seems even more glaring when you learn Peter passed away on October 3 2006. Peter Norman was a sprinter who was Australian champion in the 200 metres five times over. On October 16, he won the silver medal in the 200 metres at the 1968 Summer Olympics. His time of 20.06 seconds still stands as the Australian record, and would have won gold at the 1976, 1980 and 2000 Olympics. However, Peter is more famous for what happened during the medal ceremony. The other medal winners were American athletes Tommie Smith (gold) and John Carlos (bronze), with Tommie setting a world record time of 19.83 seconds. At the medal ceremony, as Tommie and John faced the American flag and heard The Star Spangled Banner, they raised their fists in a Black Power salute, and bowed their heads, as part of a protest on behalf of the civil rights movement. Peter knew what his fellow athletes were planning, because they told him just after the race, and asked him if he would stand in solidarity with them on behalf of the Olympic Project for Human Rights. They asked him if he believed in human rights, if he believed in God. Peter, who was a member of the Salvation Army, and vehemently opposed to racism, said, “I’ll stand with you”. John expected Peter to look frightened at what was about to happen, instead he says, he saw only love in his eyes. It was Peter’s own idea to wear the OPHR badge, which he had seen a white American athlete wearing. The fallout from The Salute affected all three of the athletes. Tommie and John were deemed to have broken the code that the Olympics must remain apolitical, and expelled from the Games. Back in America, they were criticised heavily in the media, abused by the public, and their families received death threats. The athletic establishment tended to ostracise them, and both faced some tough times. In recent years there have been some efforts to recognise them: a statue was erected in their honour at San Jose State University, where they were students, in 2005, and both received Arthur Ashe Courage Awards in 2008. (Peter asked not to have his statue at San Jose, instead requesting that his place be left empty so that any person could stand there and represent him). In 1968, Peter was reprimanded by the Australian Olympic Committee, and vilified by the Australian press. Despite qualifying for the 1972 Olympics, he was not selected, and in fact this is the only Games in which no Australian sprinters participated. This is seen as the death knell of his athletic career. His name is omitted from Australian books and lists which compile the “100 Greatest Athletes” or “100 Greatest Sporting Moments”. The AOC dispute this version of events vigorously. According to them, Peter received nothing more than a fatherly chat and some free tickets to a hockey game after The Salute incident. They claim that despite qualifying in 1972, and running a time faster than the eventual gold medal winner that year, he was nursing an undeclared injury which prevented his selection. Even as late as 2000, Peter was not asked to take part in the Sydney Olympics – a major international sporting event in which practically every other former Australian athlete was invited to play some sort of role. I’m not sure what excuse the AOC has for that. Maybe his invitation got lost in the post. Tommie, John and Peter were all martyrs for a cause, and to supporters of the civil rights movement, they were also heroes. Sadly for Peter, in his own country his gesture against racial inequality went unrecognised during his lifetime. All three men remained life-long friends, and both Tommie and John were pall-bearers at Peter’s funeral. The US Track and Field Association named the day of his funeral, October 9 2006, as Peter Norman Day. Shamefully, Australian sporting bodies have never done anything to acknowledge him, and refused to endorse the parliamentary apology. This year, John Carlos said, “There’s no-one in the nation of Australia that should be honoured, recognised, appreciated more than Peter Norman for his humanitarian concerns, his character, his strength and his willingness to be a sacrificial lamb for justice”. Australia is very ready, sometimes perhaps too ready, to celebrate physical courage. It seems we are very slow to reward moral courage, and Peter Norman remains one of our forgotten heroes. The name Peter is derived from the Greek Petros, meaning “rock”, a translation of the Aramaic Cephas in the New Testament. Peter is one of the most famous of the New Testament names, as it is the name of the most prominent apostle. It’s actually a nickname or code name given to him by Jesus, because his real name was Simon (it seems very much like calling him Rocky). Famously, Jesus puns by addressing Peter, and saying “On this rock I build my church”, to indicate that he was giving Peter the role of leading the early Christian church. Catholics see Peter as the first pope for this reason, and the impressive St Peter’s Basilica in Vatican City was built in his honour. According to tradition, Peter was martyred in Rome by being crucified upside-down. It is entirely due to Peter the Apostle that the name Peter spread throughout the Christian world. It was introduced to England by the Normans in the Old French form Piers; I bet you can guess that this is the basis for the French name Pierre, but I wonder if you also realised it was the origin of the English name and surname Pierce? By the 15th century, the modern day spelling of Peter was established. Like Jack, Peter is a name which we all seem to have grown up with, reciting the tongue twister about Peter Piper who picked a peck of pickled peppers, or the nursery rhyme about Peter the Pumpkin Eater who had a wife and couldn’t keep her. We were told the stories of Peter Rabbit and Peter Pan, listened to Peter and Wolf, and may have known Peter Pevensie from The Lion, the Witch and the Wardrobe, Peter the goat-herd in Heidi, or Peter Parker from the Spiderman comics. Because of this, there is something very cosy and comforting about the name Peter to me. Peter is a classic name in Australia which has never left the charts. It was #64 in the 1900s, and peaked as the #1 name of the 1950s. It only left the Top 100 in 2009, and is currently stable at #125. Peter isn’t an unusual name today, and it was very popular when Peter Norman was born, in 1942. Sometimes reading name blogs I am uneasy that we (and I am very much including myself here) are often too eager to suggest an unexpected name over one that is more common. 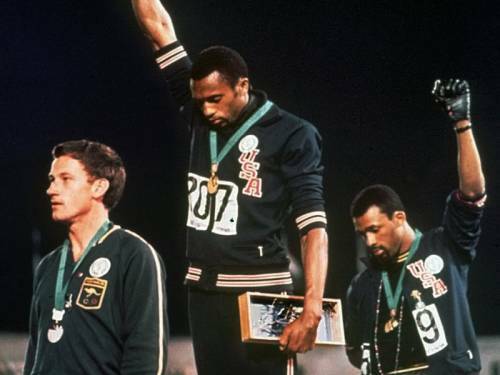 The story of Peter Norman teaches me that someone with an ordinary name may still do something extraordinary, and our name does not need to stand out in order for us to stand up for what we believe. It’s worth keeping in mind. NOTE: Some information from Salute (2008), a critically acclaimed documentary by Matt Norman, Peter’s nephew, and highly recommended viewing. Matt is currently working on a dramatised version called 1968. As an Olympic-nut, I’m so familiar with this story – well, the story of the two black athletes. I had no idea what happened to Peter Norman. To many here he goes unnoticed because his fist isn’t in the air, though he clearly has on the same badge they do. And the lines about the Olympic Code…so hypocritical it makes me sick. I’m doing a research paper on the 1936 Berlin Olympics at the moment, which are also known as the Nazi Olympics because of the horrific propaganda that surrounded them (not least of which the propaganda used to try to convince the west that Nazi Germany was a safe and peaceful place despite the Nuremburg Laws). Many leaders of the IOC, and the leader of the US Olympic Committee, Avery Brundage, were raging anti-Semites. Brundage was IOC president for the ’72 Munich Games, when 11 Israeli athletes were kidnapped and murdered, while the man did nothing to help OR honour their memory once they had died. And last night, Mitt Romney, who was behind the Salt Lake City Games, actually called the Olympics a CHARITY during last night’s debate! The rich white men running the Olympic organization live in a bubble and are distinctly afraid of social change. /rant done. Sorry!! There’s so much background to this story that I’m really glad you commented and highlighted the fact that Nazi salutes were allowed at the 1936 Olympics! Yet these were deemed to be “not political”, but “national”. Hmm, yeah … And yes, the man who sent Smith and Carlos home in disgrace was a former Nazi. There were several articles I read which basically identified Peter as “the white guy” in the famous photo, but his name was familiar to supporters of the civil rights movement, and he was really much better known in the US than in Australia (I think Tommie Smith and John Carlos made sure he was remembered). It’s not certain what Jesus had in mind, he might have meant “rock” as being a pillar of strength or the most loyal, or rock solid, or it may have literally meant he was a big strong guy, tough as rock. Rocks also play a big part in Jewish thought, with rocks as symbols of refuge and places to build temples, which fits in perfectly with him telling Peter that he was the rock on which the Christian church would be founded. He may have had several, or even all, of these ideas in mind.